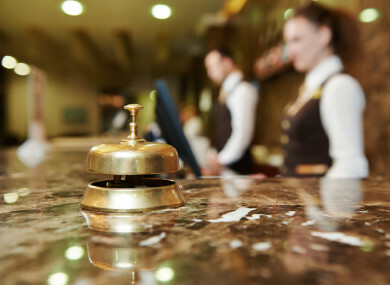 A FORMER HOTEL employee who claimed he was verbally abused before being sent home by his manager has been awarded €1,700 by the Workplace Relations Commission. The employee brought a case for unfair dismissal to the commission earlier this year following an altercation he had with his manager at the hotel in December 2017. The man, who had been employed by the hotel since June 2015, said that on the night in question, he was working in an area outside the hotel collecting glasses. During the course of his work, he alleged that he came across one of his managers, Mr A, shouting at another member of staff about broken glass on the floor. The former employee told the commission that Mr A then turned around and started shouting at him, and that he asked his manager to stop shouting at him. He said that he was embarrassed to be shouted at in front of customers, but said Mr A got more aggressive and told him “you’re walking around with your head up your arse”. The complainant said that he asked Mr A to stop shouting at him a second time, and that Mr A eventually told him to go home. He said that he took his apron off and handed it to another manager, Mr B, before he clocked out and left work. The next day, he checked a ‘group chat’ on his phone, which was his communication link to his employer. He explained that the group chat was used by Mr B, who set the weekly roster, and noted that his name was left off the roster for the following week. The man said that he went to the hotel to meet Mr B about this, and requested a P45, a reference from the hotel, and a letter explaining why he had been dismissed. However, he alleged that Mr B asked him to return to discuss the issue with Mr A. The complainant also said that he was not due to work on a Sunday a week after the conversation with Mr B, something that was suggested by the hotel to the commission. In response, the hotel agreed that the complainant had been working there for some time and said that there had been no problems with him throughout his employment. Mr A also appeared at the commission and said that on the night in question, he noticed that the area that the complainant was responsible for was a mess and that there was broken glass all over the floor. He said that he approached the complainant and told him to do his job, alleging that the complainant said that he would do it when he was ready. Mr A told the commission that he told the complainant “either do your job or go home”. After this, the hotel claimed that the complainant took off his apron and left work, and that management therefore believed that he had resigned from his job. The hotel also said that Mr B later met with the former employee and asked him to come back to talk, and that it was the complainant who said he would come back in to work with Mr A. One of the hotel’s directors also attended the hearing, where he said that Mr B had since left the business and was unable to explain why the complainant’s name had been removed from the staff roster. The director also said that he had met with the complainant to seek a resolution, but alleged that the complainant was unwilling to look for a solution. Following cross examination, both the complainant and the hotel were invited to produce copies of rosters for the period in question, particularly to corroborate claims that the complainant due to work on a Sunday the week after the altercation took place. Deciding upon the case, an adjudicator for the commission noted that the issue of whether the employee had been dismissed or resigned was “very much in dispute” between both parties. However, they noted that it was the complainant who approached the hotel to ask why he had been removed from the roster and dismissed. It was also noted that no roster was provided by the hotel regarding the disputed Sunday shift, but that copies of rosters captured from the ‘group chat’ were provided by the complainant, supporting his evidence that he was not scheduled to work that day. The adjudicator also said the rosters showed that the complainant’s name was removed from the list completely after the altercation, despite him having worked there for two and a half years without change before that. They noted that the hotel’s attempts to resolve the issue only happened months later, which was too late, and found that reinstating the former employee to his position was not appropriate, given the breakdown in the relationship between the two. Deciding, the commission said that the sequence of events showed “all the ingredients of a dismissal” and, satisfied that the complainant’s claim was well-founded, ordered the hotel to pay him €1,700. Email “Hotel worker who claimed manager told him that he had his 'head up his a**e' awarded €1,700”. Feedback on “Hotel worker who claimed manager told him that he had his 'head up his a**e' awarded €1,700”.